In the beginning, all tattoos were done in black. Once the caveman had fire, they had soot that when mixed with water that soot turned into a pigment that could be pushed into the skin. Henry Ford's comment about his Model T comes to mind, "You could get it in any color you wanted as long as it was black." Black was the only pigment in tattooing for centuries. 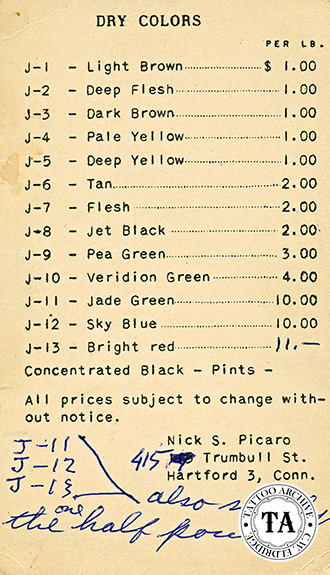 The date that the tattooist's palette expanded to more than black is lost in history, but the popular consensus is that red was the second color added, and shortly thereafter green, brown, and yellow came on board. Ingenious tattooists, often experimenting on their own body and through a system of trial and error, discovered these colors. Pouring over chemical company catalogs to find pigments that they thought might work for the tattooing process, they wrote these companies for samples. 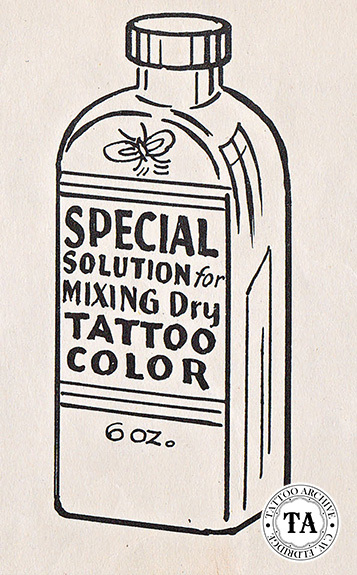 Tattooists regularly hid their intended use of this pigment from the companies, worrying that the pigment would not be sold to them if they knew if was for tattooing. 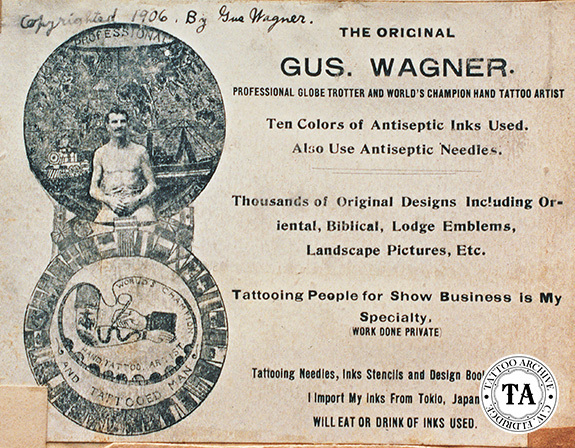 At that time tattooing was small potatoes and manufacturing companies didn't want the legal liability that came along with putting their pigment into human skin. Some tattooists created letterheads and business cards for fictitious companies so as to fool chemical companies into thinking that their pigment was going to be used for sign painting or in the making of children toys. Tattooists in the know would buy bulk powder pigment in drums from these manufacturing companies with a big savings from what they would pay tattoo suppliers. Tattoo suppliers also bought their pigment in bulk but then sold it in ¼ oz. and ½ oz. opal glass jars and ½ or 1 lb. packages. In the 1950s Spaulding & Rogers offered to "pay the postage on all orders of five dollars, and over, except on orders of ink." The weight of many of the lead based pigments forced postage to be paid by the customer. Following is an excerpt from Percy Waters 1925 catalog talking about his pigment and how to mix it. "Use only the best colors purchased from reliable dealers. They are chemically pure and harmless to the skin, while imitation colors sold by so-called importers, are nothing more than common house paint, and likely poison. Genuine colors are seldom found among the beginners, as they, not knowing the difference, use what they are told, or perhaps buy them at a far higher price. The best colors are used by the OLD TIME TATTOOERS, who know the kind to buy as well as they know a bright colored tattoo will bring them business. To mix colors right and get best results, red, yellow, and brown, mix by using ½ Listerine and ½ distilled water. Green, light or bright green, mix by using only distilled water. You should be careful to mix well, about the thickness of cream, but not too thick. The green will work better if a trifle thinner." For the past 150 years, this was pretty much the formula for color and now and again a tattooist would come up with a formula that they thought was better. The general rule for color mixing is keeping the additives simple. During this era, the first thing you would notice when walking into a tattoo shop was the smell of Listerine. During this time tattooists worked straight out of the opal glass jars with little knowledge or concern about cross contamination, and many old timers marveled at how few sore arms they had. That is not to say there haven't been problems with pigment reactions. In the last decade some major tattoo suppliers have been sued for exposing people to unhealthy levels of lead and other metals without warning. 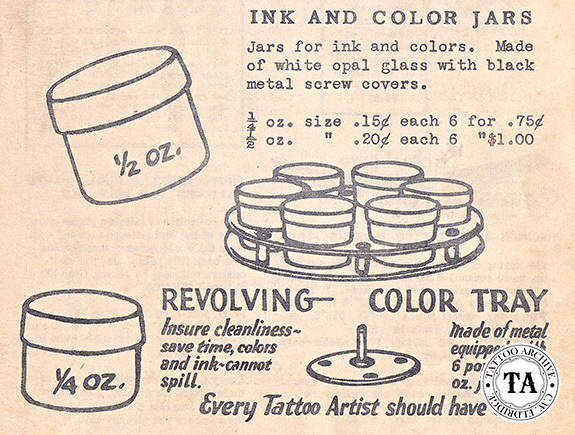 Milton Zeis was one of the first tattoo suppliers to offer pre-mixed pigment and individual color caps. He offered 14 different pre-mixed colors in screw-top eyedropper bottles. His color caps were gelatin style that could be pulled apart to make two caps and a he sold a drilled block for holding these caps. 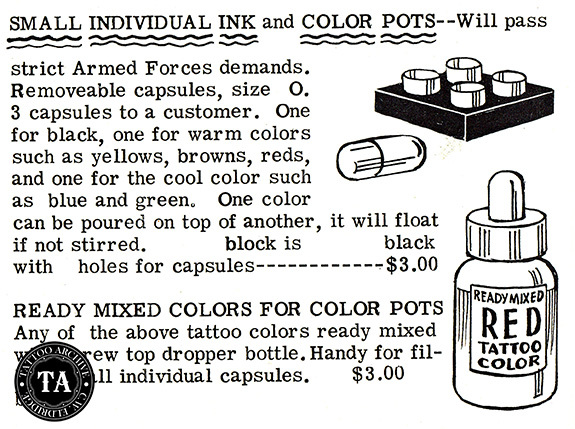 In his catalog he stated that these single service color caps would pass strict Armed Forces demands. From this statement it appears that the military was at the forefront in pushing the single service procedure that we work with today. Today of course it's a different world! Powder pigment is a thing of the past and faceless pigment companies are springing up like mushrooms after the rain. We have what could be called a full color palette; maybe not a Pantone Color Wheel palette but abundant colors and shades to choose from; but at what price? Modern tattoo suppliers offer colors that are premixed, glow in the dark, newly formulated, dispersed, pure uncut dispersed, micro organism resistant, superior light fastness, 100% organic, non toxic, sterile, FDA approved, freshly made with body friendly ingredients and be sure to check for that all important medical tamper proof strip seal, etc, etc, etc. Who is to be believed? Tattooists have long felt that it was important to reassure their customers about the quality of their pigment. 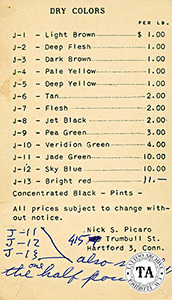 On their business cards reference was often made to the pigment they used. Looking at tattooists' business cards from the past, one might get the idea that pigment from other continents was better. American tattooists would state that their pigment was from Europe or Japan while the Europeans would state that they got theirs from America or Japan.